Many thanks to Carmen Baker Wassam for her contribution to this post. If you have additional photos, and stories about this family, you can post them in the comments, or contact us to have them added to the post! All three sons served during WWII. CPL John Bullard served in the U. S. Army Air Forces from 1942-1946. 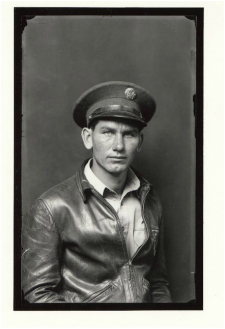 PVT Joe Bullard served in the U. S. Army during 1945. S SGT Bynum Bullard served from 1942-1946. Mary Bullard and her daughters. Back row, l to r: Sarah, Ida, Betty, Elzie, Lela. Front row, l to r: Nancy, Stella, Mary Stone Bullard, Blanche, Gladys. He served in U.S. Army Air Forces (USAAF) from 1942-1946, attaining the rank of corporal. Patsy Sue (Stone) Baker is John Bullard's cousin, she is the baby of her family and was born in 1943. She is still living. Her parents were Lonnie and Birdie (Murphree) Stone. 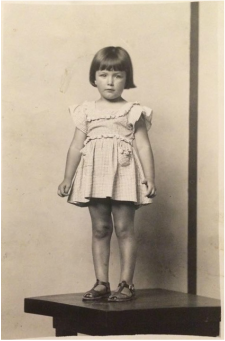 This photo taken in 1947, her mother made her pinafore, and her sandals were red. 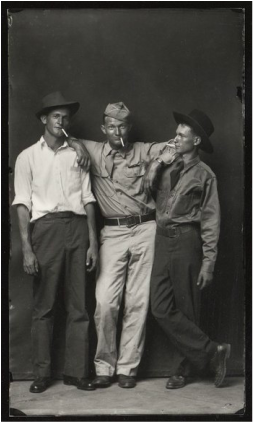 We are launching a new page on the site in collaboration with Peter Miller's database and the Historic Heber Springs, where we hope to start including personal stories from the Heber Springs community, and especially adding back stories to the wonderful Disfarmer photos! Please visit our official Facebook Page to become an active participant in the discussion, or contact us directly!